Now working with clients in Portland, Brunswick and St. George, Maine. View from the cove southeast. GASTON HOUSE- VIEW FROM SOUTHEAST Perspective rendering. View from the Northwest. Spiral stair connects all three levels and to the roof deck through a roof hatch. There is a room in the central lantern that is about ten by ten feet and is held 18 inches from the exterior glass wall. View from the dining area to the south. GASTON House: Construction over several summers since 1986. Built on an island twelve miles from the mainland. 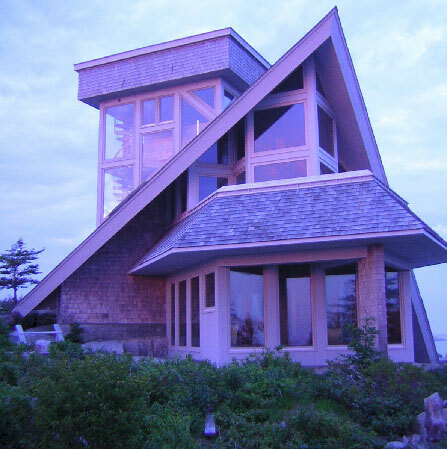 Built into a Quarry at the top of a Granite hill with 360 degree views of the Atlantic Ocean, the surrounding islands and the distant Maine coast line. 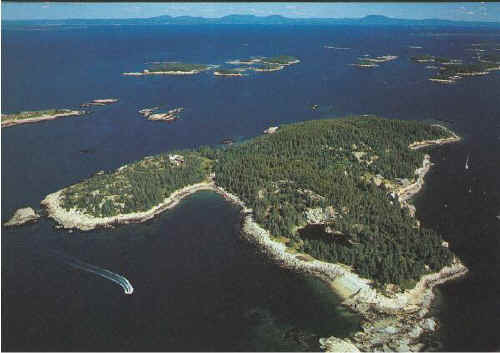 Hurricane Island from the air, looking North. The house is just to the left of the cove at the top of the hill. This is a three bed room summer and weekend house. 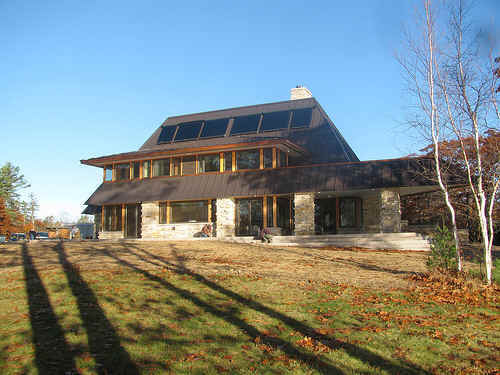 The materials are Granite from the site, wood frame, cedar shingles and glass. The total floor area is about 2800 Sq. Ft.
Concept Floor Plan Level 1 & 2. Click on Plan for detail view. This will take some time to load. Some changes were made in the working drawings. 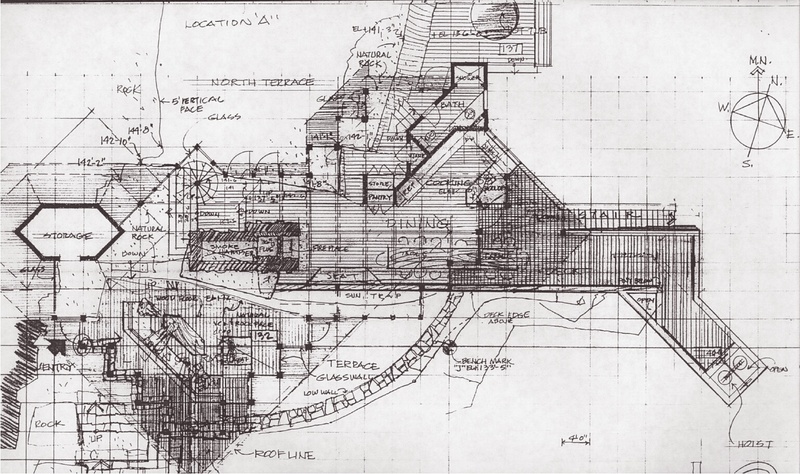 This plan shows the two lower levels including Living, Dining, Cooking, and Full Bath. Much of the Living level has the natural granite exposed as floor and walls. The circular terrace wall is built as a railing at the top of a 30 foot vertical cliff face. The need for the hoist was eliminated when a road was built up the hill to location "A" and the entry was moved to the north. The two Bed Rooms are above these main levels each with small half bath and are reached by circular stair that connects all levels. One bed room with East exposure and the other West to give a choice of early or late sun. Continue up the circular stair and the next level is a ten foot square floor set half below the roof and half above the roof. The edge of this loft space is a balcony that does not touch the surrounding walls except were it embraces the granite chimney. The outside walls are all glass and allow the natural light to flood the levels below. Continue up the circular stair and through the hatch and you have reached the top viewing deck on the roof. The living area features a massive stone walk-in fireplace with an opening seven feet high and ten feet wide. The hearth and half the walls and back of the fire place is the natural stone of the site left exposed. The granite fireplace lintel is a single stone weighing in at19 tons. It was moved by dragging it a quarter mile with a log skidder as the only heavy equipment. It was set in place by using jacks and cribbing for vertical elevation and heavy-duty come-along for horizontal moving. Living area is truly a great room. This photo is taken from the dining level above looking down with the great walk-in in fireplace just to the right. 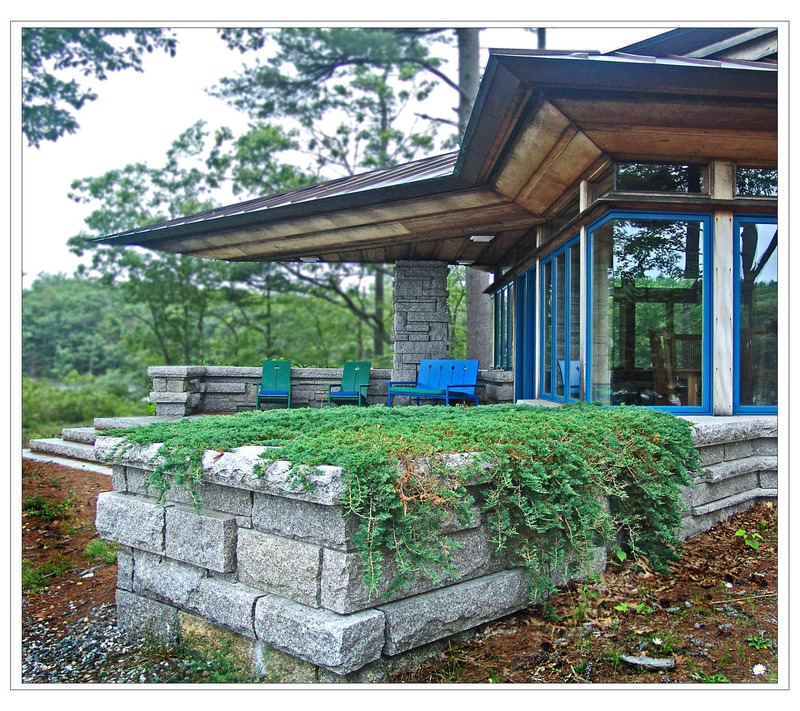 Notice the natural granite ledge which is a step up from the wood floor of the living room. This natural ledge is the hearth of the 7 foot high by 10 foot wide walk-in fireplace. I continue to practice with a focus on one of a kind design, created from the needs and conditions of each client, and expressed through the principles of architecture I have learned through practice and the study of life.